Welcome to Oval Space Cinema. Every month, we’ll be transforming East London’s iconic venue into the perfect environment to catch a hand-curated selection of alternative films, replete with state of the art D&B Audiotechnik sound, comfortable seating, a fully stocked bar (open throughout proceedings) and food offerings from around the globe. Not content with just screening provocative movies, we’ll journey beyond the screen, hosting Q&A’s with directors and cast members, interactive cinema experiences, audiophile listening sessions of soundtracks and plenty more besides, without the inflated prices of many established film clubs. 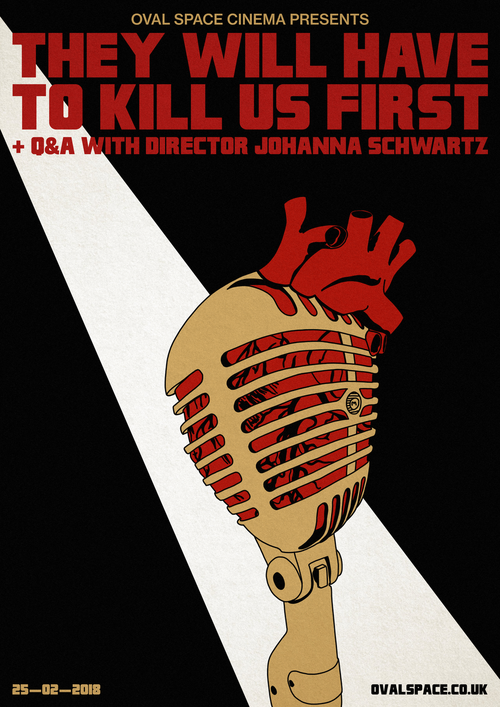 Kickstarting Oval Space Cinema is award-winning documentary 'They Will Have To Kill Us First'. In 2012, music in Mali disappeared overnight when Islamic extremist groups rose up to capture an area the size of the UK and France combined. But rather than lay down their instruments, Mali’s musicians fought back, defending one of the most important forms of communication in a colourful display of courage, captured intimately by award-winning American-born, UK-based filmmaker Johanna Schwartz. Songhoy Blues, the films protagonists and nowadays critically acclaimed and globally touring desert blues band, performed their first show outside of Mali at Oval Space back in 2013, so you’d be hard-pressed to find a more suitable film for our inaugural screening. In-line with OS Cinema’s commitment to go beyond screening great film, the night will also host a listening session of They Will Have To Kill Us First: Malian Music In Exile (Original Motion Picture Soundtrack), plus a live Q+A with Schwartz.